Girls who get "in trouble" were big news in the 1950s, although the problem had obviously been around forever. Teens were being exploited as hellions or criminals or gone crazy with rock 'n roll, and there wasn't much parental comfort to be had this side of syrupy Pat Boone movies. Both entries in this obscure Youth Run Wild double bill are actually very good pictures and nowhere near as trashy as the more visible A.I.P. offerings like Reform School Girl and Runaway Daughters. The kids in Too Soon to Love and Unwed Mother are likeable and believable, and the plotlines are dramatically sound as well as socially responsible. Viewers hooked on camp values will also be interested to see Jack Nicholson and Robert Vaughn strut their stuff early in their careers. If society needs a cautionary tale about teenage pregnancy, this is the one to show. Not that it would have done any good, but the saga of ordinary high school students Jim and Cathy has an almost universal application: Any kid in any kind of trouble can identify with them. It's filmmaker Richard Rush's first directing attempt. Despite the low budget and technical shortcomings he shows considerable skill with inexperienced actors. Cathy Taylor (Jennifer West) is prone to staying out too late, a problem made worse by her abusively cruel father (Warren Parker). Her new boyfriend Jim Mills (Richard Evans) proudly goes into debt with his best friend, barber Hughie (Ralph Manza) to buy a junky old car for dates. Sure enough, when emotions get out of control Cathy and Jim go too far, and they are soon thrown into a situation for which they're totally unprepared. 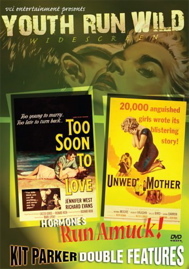 Too Soon to Love had the good fortune to be picked up by Universal-International in 1960. Perhaps it's not well known because of Fox's Blue Denim, which had covered similar territory the year before. That picture presented two kids (Carol Lynley, Brandon De Wilde) who act more like pre-teens than teens, and puts them in a world of caring parents who come charging to the rescue with love and understanding. Jim and Cathy don't have it as good. We never see or really hear about Jim's parents or where he lives. It's a failing of Laszlo Gorog's script, because we would think a nice guy like Jim could find a way to take his problems home. He's instead given a barber friend who sort of acts like the friar-messenger in Romeo and Juliet, helping Jim with cash when he's in a spot. Cathy's dad is a brutal jerk who can't handle the fact that his daughter is seeing boys at all. We understand her attitude entirely when he shouts her down and hits her for trying to talk to him. The lovers' isolation is complete. Jim is no superhero; a hood named Buddy (an amusingly nervy Jack Nicholson) beats him up at a drive-in theater. Cathy has nobody to share her problems with. In one effective scene she comes home in a miserable mood, only to hear her parents congratulating her sister-in-law on her happy and legitimate new pregnancy. In another nice contrast, Jim ignores his high school counselor's excitement about his scholarship opportunities because he's straining to hear the doctor's verdict on Cathy's condition. The two essential situations for the "teenage pregnancy" subgenre's are "The Trip to the Abortionist" and "The Desperate Teen Father Turns to Crime." We meet Cathy's would-be abortionist (Billie Bird, also in Unwed Mother and Blue Denim!) in her filthy kitchen, but the kids skip their illicit appointment when they see Bird's previous client descending some stairs looking as if she were going into systemic shock. Unable to raise $500 for a real doctor (who nevertheless treats Cathy as if she were moral scum) Jim pulls off a hopelessly botched robbery, racing to bring the cash to his girl before the cops can nail him. Too Soon to Love is designed to lower the blood temperature of honest kids who might be, uh, experimenting. It does so honestly. The melodramatic chain of events is consistent with their nightmare of emotions. This picture sticks with the kids: Jim comes to Cathy's father to explain himself and perhaps figure out a solution, and is beaten up and thrown out for his trouble. When Dad finally learns what has happened he begs Jim to take him along but gets left behind on the sidewalk. There's no "we'll work it out" reconciliation and no, "It's not Jim and Cathy's problem, it's our problem" phoniness. This is a very good drama that still works. Neither leading teen player is perfect, which lends Too Soon to Love an interesting kind of honesty. Richard Evans is a 25 year-old with a baby face that helps him pass as a high schooler; someone's taught him a lot of Steve McQueen / Anthony Perkins mannerisms that don't get in the way. Cathy Taylor is 19. This is her only film among a large TV output, which testifies to the lack of recognition for teensploitation actors at this time. She's fresh and sincere, albeit a little stagey. Director Richard Rush handles the performances well enough. Elsewhere the film suffers from insufficient night lighting and a general haste -- budding film actors get few compliments when they're given only one take to get a scene. The camera work is always in focus but tends to be oddly framed (see the overall transfer note below), which does not give high marks to cameraman William C. Thompson, of Edward D. Wood fame. The editor, however, went on to do such interesting pix as Harper, Vanishing Point and Fedora. Unwed Mother's trailer uses the twisted tag line, "There is a name for her, but see this movie before you use it!" Yet it's an even better Teen Pregnancy story. In Blue Denim we couldn't really imagine the two kids being intimate (our mistake) and Too Soon to Love still carries a residue of TV dramatics. Unwed Mother has even richer characters and a less sentimental attitude. We stick closely to the teen mother, here portrayed by the fine actress Norma Moore. Naïve Betty Miller (Norma Moore) moves from Salinas to L.A. with her widowed mom and takes a job in a department store, where she's immediately picked off by the egotistical sociopath Don Bigelow (Robert Vaughn), a lady killer who uses lies and flattery to maintain a string of sweethearts that includes his own department boss. Betty believes his stories about being a rich kid "waiting for some bonds to arrive" and signs over her paychecks to him. He uses them to romance a rich girl. Needing money to rent a tuxedo, Don uses the foolish Betty as an unknowing getaway driver in a stupid robbery. When it's discovered that she's in a family way, the authorities offer to let Don out of jail if the two marry. The baby forces Betty to make one hard decision after another. Unwed Mother was promoted as a cheap exploitation picture; its assistant director was offered his first director credit but turned it down because he didn't want to be associated with a movie like this. The Allied Artists release is as obscure as they come but plays as a superior drama with no excuses, right down the line -- even the acting is good. We know immediately that Betty Miller is easy prey for a handsome guy with the right moves. Norma Moore has an open face, like Kim Hunter in The Seventh Victim with the addition of a slightly babyish smile. All the other L.A. girls drink beer and seem on intimate terms with their boyfriends, and the handsome Don Bigelow comes on like Prince Charming. Bigelow is Robert Vaughn's first opportunity to do what he does best, which is to be a conniving slick creep, as in Bullitt. He uses the same narcissistic disdain in The Magnificent Seven only two years later. Don Bigelow thinks of himself as Don Juan while coming off as a functioning psycho, conning one girl after another. His goal is a rich wife. He uses one woman's car and Betty's money to put on a false front of wealth for a third girl who drives a Thunderbird. Unwed Mother doesn't subscribe to the fantasy that first love is untouchable magic. Betty is a sweetheart but also a pushover blinded by emotion -- all Don need do to take her money and make love to her is give her a cheap trinket and allude to vague promises of marriage. Although the lawmen probably consider Betty innocent of the robbery, she's given a five-year probation. During her stay in jail with a bunch of streetwalkers she meets Gertie, a showgirl-madam played with relish by Too Soon to Love's Billie Bird. Betty later goes to Gertie for help, and is referred to the most frightening abortionist conceivable -- Timothy Carey! He talks like a thug and has greasy bits of hair hanging in his face. Betty's forming the ability to make adult judgments and takes it on the lam even though she's heavily sedated. Our girl ends up at a "baby farm" Home for Unwed Mothers, where the film's script works its way to a satisfactory finish. The other girls deal with shame and unhappiness as best they can, whether they're plain or beautiful. They pitch in for a wedding ring to give to one girl who decides to keep her baby. The ring will help her maintain the illusion of a husband in an unforgiving world. Unwed Mother doesn't present the Home as a necessarily altruistic place. An administrator (Jeanne Cooper from Plunder Road and The Intruder) admits that Betty's baby is going to a more elderly couple because they've been generous with charity contributions. In a melodramatic finish, the administrator's motives are put in question when she admits to having been an unwed mother herself. The "uplifting" ending makes no promises for Betty's happiness with her baby. Of course, the oddest thing in the picture is that Betty is allowed to see and bond with her baby after the birth even though she's giving it up for adoption. I believe such things are strongly discouraged now. This particular unwed mother's home functions like some kind of moral prison for despairing girls. Like much of the talent in these low budget program pictures, director Walter Doniger's credits are mostly in television. His good work relies heavily on two-shots and close-ups that must have made Unwed Mother a socko audition reel for Robert Vaughn. The movie has only a few exterior setups and uses rear projection for an unconvincing, one-angle-fits-all beach scene. We see a neighborhood theater that used to be on Sunset Blvd, the Oriental. I remember pulling into its covered driveway. One stock shot is an old street scene from the early 1940s. Another shows a triangular town square that's clearly an outtake from Invasion of the Body Snatchers, complete with a bus pulling up carrying new Pod victims. The Youth Run Wild double bill is another fine combo of late '50s ephemera from Kit Parker and VCI. Too Soon to Love's transfer is flat and possibly a little tight, especially on the left. It may be badly framed in the camera because faces still crowd the bottom of the frame with plenty of open airspace above. Is this the curse of Ed Wood? Unwed Mother is enhanced widescreen and benefits from the added detail. Its framing is also a little off, as if the movie needed to be transferred at 1:66. Titles are tight all around and people's chins again tend to dip off the screen in some shots. Assistant director Robert Justman provides a commentary for Unwed Mother. He barely mentions anything about the film and prefers to give us a run-down of the parts of his career we don't need to hear about -- mostly his later success as a producer of the Star Trek series. Justman was a production assistant and assistant director on many top films noir and must know important secrets about films that do make us curious, like Joseph Losey's The Prowler and Robert Aldrich's Kiss Me Deadly. But we don't hear anything about that. He relates a prolonged story of how he entered the motion picture business: His dad was a producer. He uses at least six minutes to assure us that he got into the Director's Guild on his own steam. Justman offers almost nothing on Unwed Mother except misinformation about Robert Vaughn, and makes no mention of the anonymous but talented and pretty actresses in minor roles. Some of their credits extend back to TV shows Justman worked on, indicating that he may have helped them during casting. But no, we have to hear how Justman 'discovered' Patrick Stewart to be Captain Picard. The Unwed Mother commentary is heartily recommended for fans of Star Trek: The Next Generation. Picture and sound quality on both films is good, and VCI's menus show improved design and animation. Trailers and a fancy art and still gallery are on board as well - the poster image of Betty kneeling in shame is iconography at its best. This is a very satisfying double bill. Savant was expecting shows more like the cheapjack Teenage Doll and was instead pleasantly surprised.